This may be a slightly late update. So yeah, last month there was an AMD launch event at Silverspoon, Publika. It was about the launch of the new A-series APU cores. Available models are the A4, A6, A8 and the A10. The term A-series also means Accelerated Processor Unit which incorporates graphic technology to increase the speed for games. A gaming rig running on one of the latest AMD processor, FX-8350 with Radeon HD 7990 Cross Fire. Running on the latest APU A10 processor. Acer laptop using the A6 processor. Mr Alex Tan, I think he was the country manager, giving the opening speech. Literally almost all the slides. Free buffet sponsored by AMD and Silverspoon. My plate! Looks fantastic. Filled with flavours. 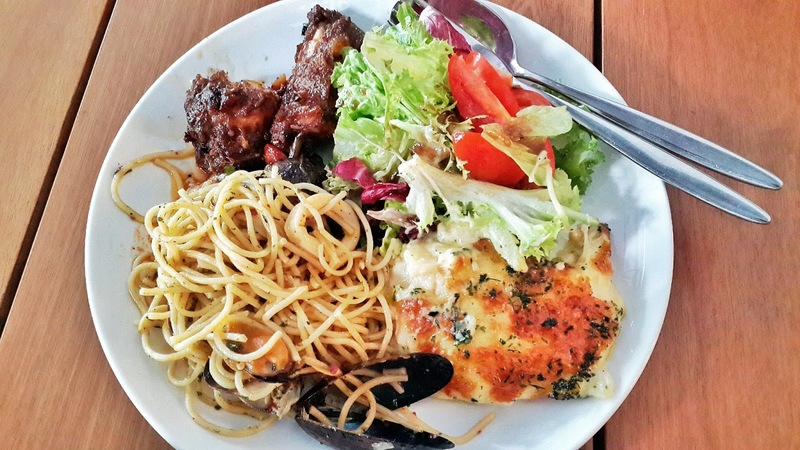 Spaghetti was packed with flavours of seafood and herbs. Baked potatoes were also packed with flavours, not to mention baked to perfection. Potatoes were soft yet consistent. Salad was really fresh, along with a splash of vinegrette, splendid. Roast beef ribs were tender and juicy. Sauce was fantastic. That ends the day for now! ahahahha, this is just a quick update.